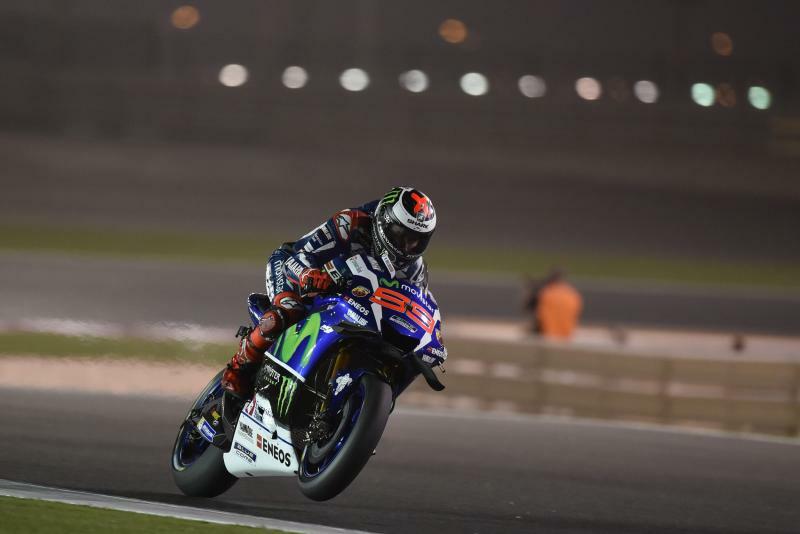 Despite leading the MotoGP™ field by over a quarter of a second, Jorge Lorenzo feels he can go even faster in Qatar. 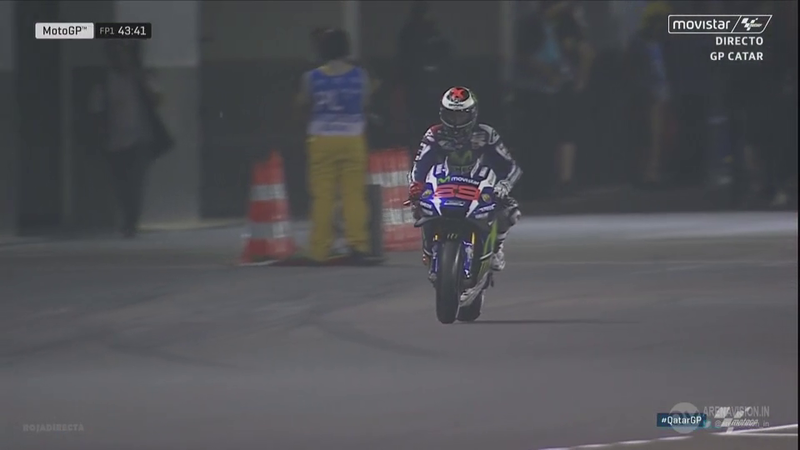 Having left the Qatar Test as the fastest rider in the premier class, Jorge Lorenzo continued his form as the Commercial Bank Grand Prix of Qatar began. Thursday saw riders in the MotoGP™ World Championship have just one session, the night race offering not only a unique visual spectacle but also a unique schedule. In the lone session Lorenzo set a 1’55.440 aboard his Movistar Yamaha MotoGP M1 to top the timing screens. The time saw him 0.267s ahead of his teammate Valentino Rossi, the factory Yamaha squad showing as the strongest team at this early stage with a perfect one-two. In good physical shape, Lorenzo was able to push from the start of the session as he went into race mode. During the session Lorenzo set four laps in the 1’55s, Hector Barbera (Avintia Ducati) the only other rider able to set more than a single 1’55. If his pace continues in this manner, the triple MotoGP™ World Champion could very well head into race day as the favourite. Friday the 18th of March will see premier class have two practice sessions, offering double the amount of time to practice. Jorge Lorenzo: “I had a good start. From the first run I was able to have the best lap time and probably also the best pace, but we still have a margin for improvement both in lap time and pace. We will keep working on the setting and the electronics to improve in some areas for tomorrow. The track will also be better with more grip level tomorrow and the lap times will be faster. 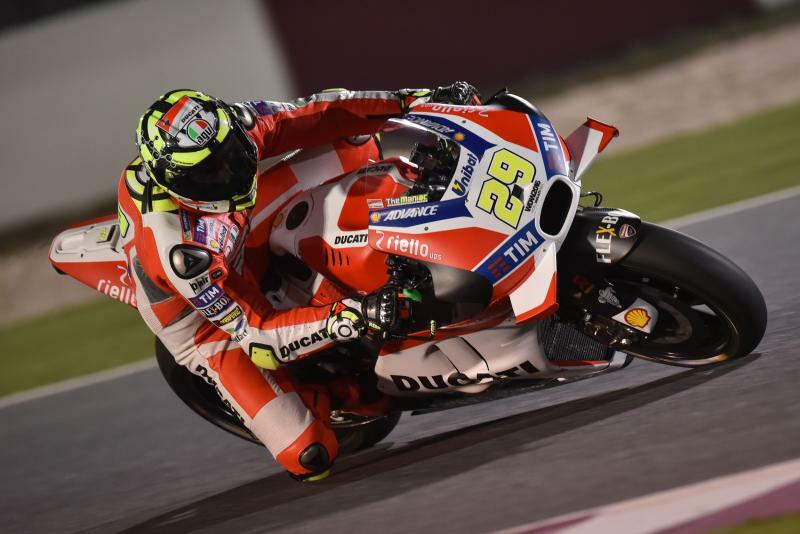 A top three finish in practice for Andrea Iannone has the Italian satisfied but looking for more in the coming days. The first race weekend of 2016 is finally here for the MotoGP™ World Championship, the Commercial Bank Grand Prix of Qatar opening what is set to be an incredible season. It started well for Andrea Iannone (Ducati Team) as the Italian completed Free Practice 1 in third. A time of 1’55.736 put him 0.296s back on Jorge Lorenzo’s (Movistar Yamaha MotoGP) best time, cementing Iannone as one of only two riders with 0.3s of the Spaniard. There’s still a lot more to come as Iannone spent the entire session on the harder rear tyre. With two more Free Practice sessions on Friday, Iannone will have plenty of time to improve and close the gap to Lorenzo and Valentino Rossi at the top. Corner entry is one area where Iannone and his team feel the can improve and make up some valuable time. Although Iannone set the third fastest time, his consistency was not at the same level as Lorenzo and this is another area he will need to improve ahead of the Sunday race. Hard work during testing pays off for Valentino Rossi as he starts the Commercial Bank Grand Prix of Qatar in second. Valentino Rossi walked away from Free Practice 1 satisfied with the work he and his team had done, able to set the second fastest time while completing 17 laps. 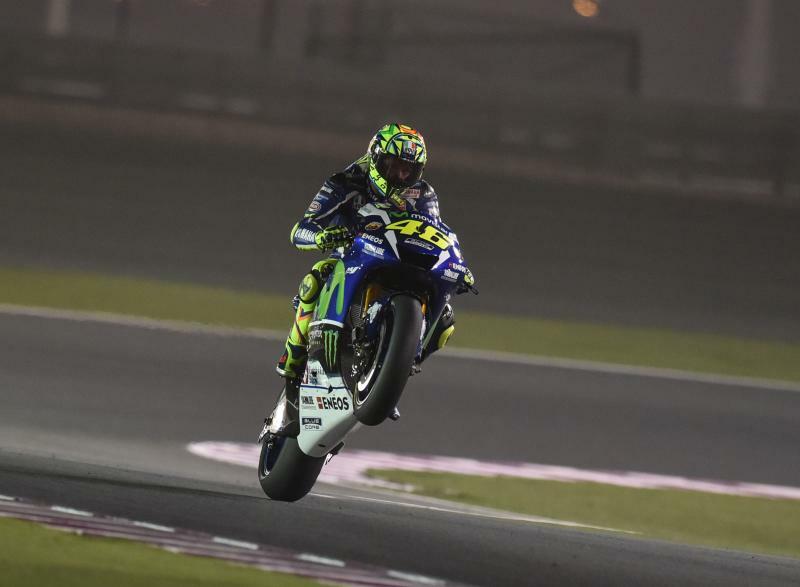 As soon as his tyres were up to temperature Rossi began to push for faster and faster times, setting his best lap on his final circulation of the Losail International Circuit. Although his pace steadily improved, his Movistar Yamaha MotoGP teammate, Jorge Lorenzo, had the upper hand not only over one lap but also in relation to overall pace. Rossi was not focused entirely on times, instead working on improving the balance of his YZR-M1 to better improve his feeling with the Michelin tyres. Friday will see the MotoGP™ World Championship out on track twice for FP2 and FP3, ending inside the top ten will be vital as failing to do so will force a rider to head through the difficult Q1 session. With the top ten inside a second of each other’s best times, Rossi will have to continue working throughout the weekend as no doubt his rivals will be snapping at his heels within no time. A strong fifth place finish has Maverick Viñales confident of a strong opening weekend after using only the hard tyres. 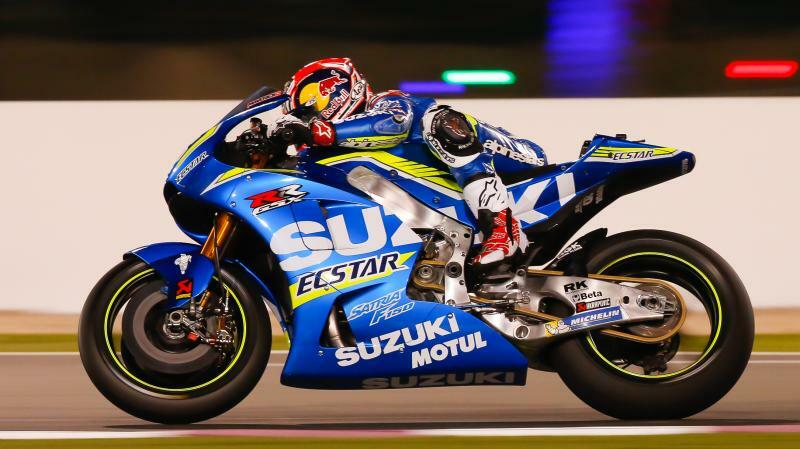 The Commercial Bank Grand Prix of Qatar marks the start of the 2016 MotoGP™ World Championship, Maverick Viñales overjoyed to finally be back racing. The Team Suzuki Ecstar man hit the track early for Free Practice 1, the only session for the MotoGP™ class on Thursday in Qatar. Viñales was able to continue where he left off almost a month earlier in testing, his GSX-RR starting from an already strong position. With his base setting more of less defined, Viñales took the opportunity to use the same set of tyres over 16 laps and better understand the tyre drop off. There was some drop but overall Viñales was able to maintain decent feeling even as the lap count grew. A best time of 1’55.847 came for Viñales to put him fifth in the session and within half a second of Jorge Lorenzo’s (Movistar Yamaha MotoGP) session topping time. 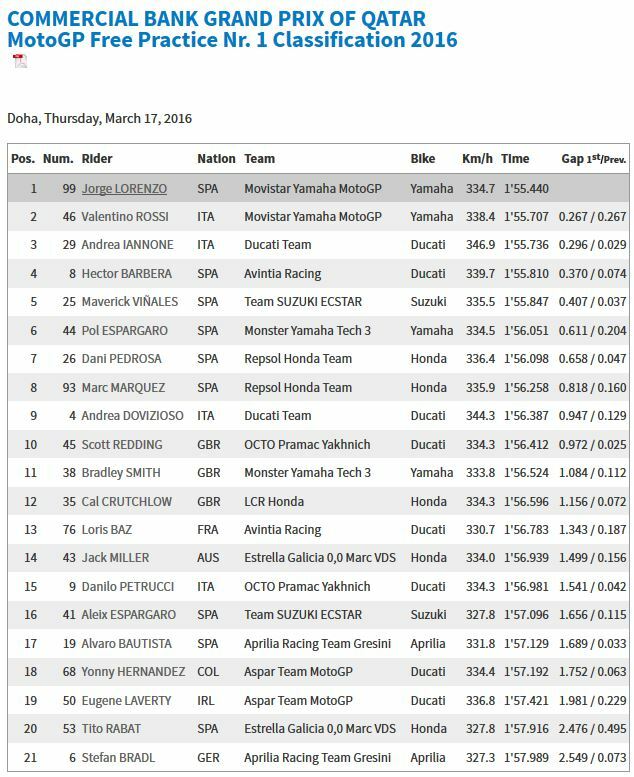 Interestingly, Viñales’ times improved as the laps increased with his best time coming on his final lap. It seems that the Michelin tyres take several laps to get up to temperature, the start of the race could be a cautious affair. An elated Hector Barbera takes huge profit from the new technical rules as he finishes as the fourth fastest rider on Thursday. The opening day of the opening round of the 2016 MotoGP™ World Championship got off to an almost ideal start for Hector Barbera. Of all the riders in the premier class, Barbera has perhaps seen the greatest benefit from the new technical rules as he has routinely been able to put his Avintia Racing Ducati inside the top five. 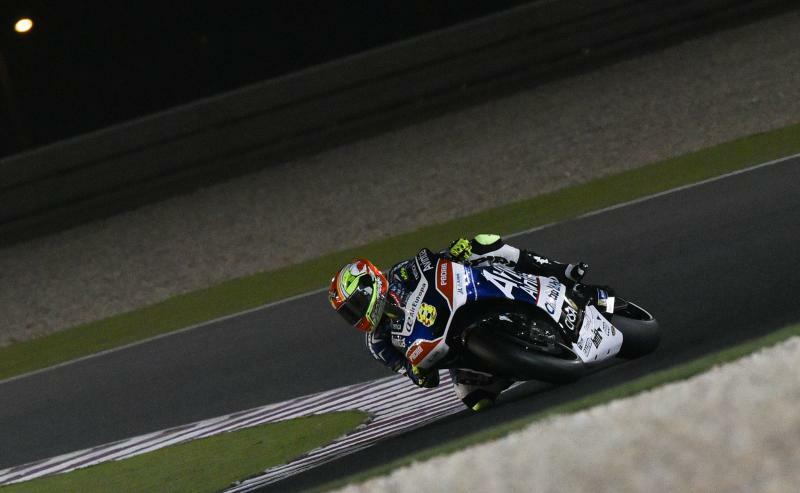 Despite having tested in Qatar just a few weeks before, track conditions had changed quite a lot and Barbera focused on altering the electronics to suit the tyres and new track condition. Even though he wasn’t pleased with the condition of the track, Barbera managed a 1’55.810 to put him fourth overall. Work will continue on Friday for Barbera and the Avintia Racing team as they look to improve the bike through mid corner and corner exit. Barbera was the only rider other than Jorge Lorenzo (Movistar Yamaha MotoGP), who topped the session, to complete more than one lap in the 1’55 range. The two Free Practice sessions on Friday will see Barbera fight for the top ten in an attempt to gain a pass directly into Q2.